China Consumers Association (CCA) held apress conference on January 12, 2017 in Beijing to unveil the theme of 2017:“Network Integrity, Worry-free Consumption”. Mr. Chang Yu, Secretary General of CCA,interpreted the connotation of the theme: First, advocate integrity operationin the network economy, strengthen the sense of responsibility of networkoperators, effectively implement statutory obligations, and consciously protectthe legitimate rights and interests of network consumers. Second, establish andimprove systems for the protection of the rights and interests of consumers interms of the right to know, right of claim, trading right and security right ofnetwork consumers, make use of new impetus of "Internet +" to consumerlife and economic development. Third, organize social supervision and act as abridge, build a platform for social co-governance of network consumerprotection, build close network community with a common future, and construct aguaranteed network consumption environment. According to Mr. Chang Yu, thefast-growing network economy featuring e-commerce has become a strong drivingforce for economic growth in China. It has played an irreplaceable role inexpanding consumption, stimulating economic growth and achieving the freeselection and autonomous consumption of consumers. However, the problem ofinfringement on the legitimate rights and interests of network consumers hasbecome prominent, which restricts the healthy development of network economyand the implementation of the “Internet +” development strategy. The theme of2017 calls for resistance against dishonest operations damaging the interestsof consumers in the network economy and for the construction of a worry-freenetwork consumption environment. Mr. Chang Yu said that CCA would workwith all consumer associations throughout the country to carry out work fromfive aspects around the theme: First, vigorously carry out publicity activitiesaround the theme, together with the “International Day for ProtectingConsumers’ Rights” and special events about the theme, to guide the publicfocus on the hot spots of network consumption and promote the integrityconstruction of network management. Second, widely publicize and implementprovisions on the protection of the rights and interests of network consumersin the new Law on the Protection of theRights and Interests of Consumers and other relevant laws and regulations,issue early warning about network consumption, improve the awareness ofe-commerce enterprises about performing responsibilities by law, improveconsumer self-protection awareness, enhance network consumer confidence andcreate a good consumer atmosphere. Third, strengthen social supervision oninternet-based commodities and services, continue to carry out consumptionexperience and observation, service assessment, investigation and comments,comparative testing, disclosure and other activities on relevant festivals,“Double Eleven” and other important time nodes in fields where it’s difficultto protect the rights and interests of online consumers. Supervise and urgenetwork operation industries and operators to strengthen self-discipline.Fourth, make an innovative way of complaint acceptance, and vigorously explorerapid settlement mechanisms about consumption disputes in network consumption,service consumption and other fields. Build and ensure smooth channels such astelephone, WeChat and network, to facilitate consumers’ complaints andconsulting and effectively protect the rights and interests of consumers.Fifth, broaden the communication and exchanges with overseas consumerorganizations, explore, build and improve the coordination mechanism for theprotection of the rights and interests of consumers related to transnational,cross-border and overseas purchasing, effectively settle transnational orcross-border consumption disputes, and improve the mechanism of onlinecompliant and after-sales protection of the rights and interests of consumersfor network trading. At the press conference, the 2017publicity poster of the theme was also released. 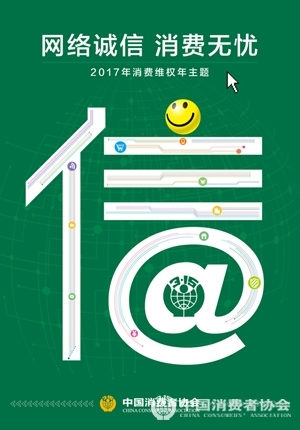 The poster displays a bigChinese character “Xin” (Integrity) against the background of globalinformation interconnection and is embellished with some typical networkconsumption symbols, to convey the core meaning of the theme: Networkconsumption should be integrity-oriented. Mr. Dong Zhuli, Press Spokesman andDeputy Secretary General of CCA interpreted the design ideas of the poster asfollows: The Chinese character “Xin” on the poster has four meanings. First,emphasize that the theme “network integrity” is the core goal; second, thefield of network consumption requires comprehensive, accurate, true andtransparent commodity information; third, network operators need to effectivelyprotect the personal information of consumers; fourth, only the integrityoperation can bring consumer confidence.